This angel is part of a Marian shrine in the Milwaukee archdiocese. It's nestled in a residential area, and was close to the first apartment Bo & I shared. 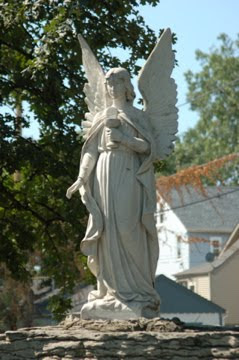 There are statues representing Fatima, stations of the cross, and a few other statues. It's a very restful place, and I would visit often when we lived close. When we make our infrequent trips back to WI, I always try to find the time to visit at least briefly. Did you play Wordless Wednesday yesterday? Be sure to tell your story today and link to Tell Me Thursday! That is a beautiful statue. I remember we had statues similar to that at my high school scattered around under old trees. I agree they are very peaceful and a great place to go meditate. It is a beautiful statue! Nicely done, Melanie. I liked the way you told the story behind this beautiful piece of art. My "Tell me..." post is here. Have a great day!